SKU: 4101-09-S98. Category: Universal Colibri. Colibri Universal Power Window Kits are patented design, universal power window kits that essentially can be installed on any vehicle originally equipped without power windows. The name COLIBRI is recognized throughout the world for its qulaity and ease of installation. The 4101-09-S98 is a complete 2 door universal power window kit packaged with 3 switches. 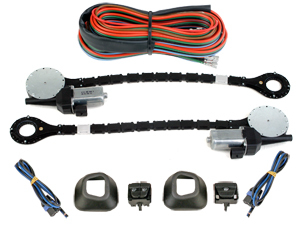 The three switch kit allows the driver to operate both windows from one location. The switches come with flush mount bezels for a clean smooth look. Colibri Power Window Kits are perfectly suited for any front or rear door application. Colibri easily installs behind trim panel and does not in any way alter the original door panel. 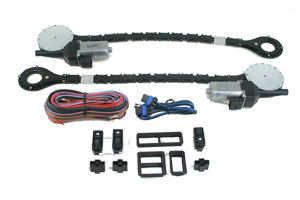 All components and hardware necessary for installation are included in our kit. Limited Life Time Warranty – Colibri Power Window Kits offer a limited life time warranty on the motor and drive mechanism. No other manufacturer of universal power window kits offers such a broad base warranty on their kits. The Colibri warranty is your guarantee of the quality built into every Colibri Power Window Kit.